BEACH HOUSE, WITH A DIFFERENCE, unique beach and sea view with SNOW capped mountain view in winter, and most sunshine hours in New Zealand in summer. Modern, clean, yet a BEACH house and Nature Retreat type Lodge.ECO friendly guide lines to minimise carbon footprint. Ideal location for Abel Tasman NATIONAL PARK. AS A PRIVATE SPACE of two SEPERATE UNITS suitable for 1or 2 COUPLES or friends, not family as the units are apart and function separately. We do not encourage combining the units. Perfect location for the Abel Tasman NATIONAL PARK. Combined units only available in high season 1st October to 30th April. Self contained unit available all year in high and low season. 1) SEMI-DETACHED Unit to main house yet private SELF CONTAINED with kitchenette and own inside bathroom. Large bedroom, own separate kitchenette, and own bathroom.Luxury Queen bed. Bed and breakfast style, own FRIDGE. Own LOUNGE, large windows all round for light. Studio bedroom with SEA view; own entrance; open plan and own outside atrium AL FRESCA garden bathroom. Queen luxury bed and king single bed. NOTE. Studio unit available only in high season. PERFECT LOCATION for Abel Tasman NATIONAL PARK. •A QUIET SHELTERED BAY OF UNIMAGINABLE VIEWS ! Glowing Sunsets. •A sacred place, of quiet; sounds of water and birds. A private property, sheltered by indigenous trees and shrubs.Situated in a quiet cul-de-sac and gateway to a Beach Reserve. A peaceful haven of beaches, trees and bird-life. Only 2 min. 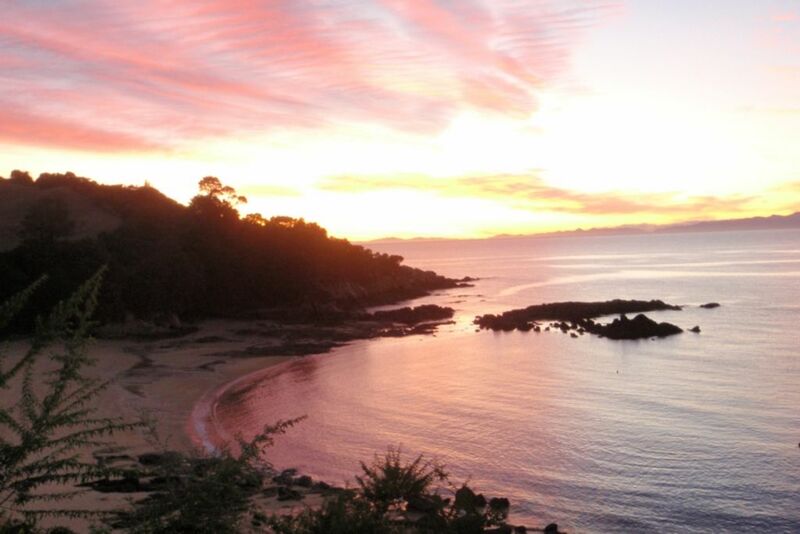 from the bustle of Kaiteriteri; water-sports, mini-golf, health spa, excellent restaurants and sea shuttle that can take you into the Abel Tasman Park beaches. We offer walks,tours within the Abel Tasman Park. The Mountain Bike Park;Taste Tasman Cycle Trail on the doorstep follows the coast for miles. Golf courses, Cinemas,andchoice of shops, supermarkets and restaurants. The coast and rivers for sea or trout fishing. Golden Bay (20 to the old style town of Takaka. Pupu Springs,the purest fresh-water spring in the world of icy crystal clear water. Wharariki Beach, with huge caves, sand dunes and rock formations at the ends of the earth. To respect the peaceandamp;the unique quietandamp;natural environment.Keep your carbon footprint at a minimum as per house guide lines listed in house. Professional Pizza oven, at $25 per pizza. CONDITIONS: A key deposit,breakageandamp;damage deposit called a SECURITY BOND of $150 is to be paid, PER UNIT,with the other 50% BALANCE due 30days prior to arrival, or as cash on arrival. (refundable on proper vacating and amp;cleanliness) , leaving no stringent food smells. This is a Sacred Haven and Paradise of peace and quiet, unique, pristine beach front property onto the Secluded TAPU (Sacred) Bay of Kaiteriteri. Ideally situated for the Abel Tasman National Park, Riwaka Resurgence, Valley Wine Trail, Pupu Springs in Golden bay and a haven of special sights, with the MOST SUNSHINE HOURS IN New Zealand. Magnificent sunsets with beach and mountain views. Pristine and quiet setting, with lots of bird life.Special garaged undercover parking for vehicle and boat if requested. toilet, combination tub/shower, tub, Shower and basin, heated towel rail. toilet, outdoor shower, This a an atrium al fresco outside bathroom, onto the beach. Beach front onto Tapu (Sacred) Bay Reserve. Literally 30 metres from the ocean front. A coastal environmental area next to Kaiteriteri. Very quiet and pristine. View of surrounding mountains and beach together. Unit 2 bed and breakfast style has its own lounge, living room area, open plan onto studio bedroom. Unit 1 self contained unit has a stove only. Unit 1 self contained unit has a kitchenette. Unit 2 studio bedroom has its own lounge open plan with sea view, and is a bed and breakfast unit with no kitchen. Both have fridges, kettles etc. Eco singel and Eco double for hire at $35 per person for 2 to 3 hours. This property is ideally situated for guests wishing to explore and discover the Abel Tasman National Park and surrounds, the Kaurangi National Park, and the nearby Golden Bay Area with the Pupu Springs and Waimea waterfall. There are a number of beaches in the area (only 10 minutes walk) and one secluded beach and bay on your doorstep. CONDiTIONS: Respect the peace and quiet and pristine environment of house and surrounds. Minimise carbon footprint. General house guide lines posted up in the unit. A $150 security bond is required on arrival, fully refundable on proper vacating. Just wonderful and stunning...... perfect location for exploring the Abel Tasman! You were a wonderful guest, a lovely special person and it was such a pleasure to share in this serenity, beauty, peace and quiet on-the-beach. Please come back anytime. We have a new outside steam sauna too, and in keeping this as a pristine, nature eco lodge type accommodation. The property had everything that I needed, very close to the beach. The property had everything that I needed, very close to the beach. So much so I booked again straight away! Awesome property in a great location ~ slice of heaven. Awesome property in a great location ~ slice of heaven.... great value! We will be back. Thank ypu. You are welcome here anytime. Ka ki te ano. For our needs with a party of four adults, the location was perfectly acceptable, but the layout and organisation of the house was not what we hoped for. Sharing the one bathroom with the host and his wife was not satisfactory. The lack of WiFi and television was another major disappointment. The upstairs bedroom was very warm and lacked sufficient ventilation. The lounge provided lacked suitable comfortable seating. Thanks Nikki. Lovely to have you stay.?? Walkway to the beach is 4 minutes. Walkway to the beach is 4 minutes. Fully equiped kitchen with a great outdoor cooking area. The walkway is to main Kaiteriteri beach. The accommodation is literally on the beach reserve , 50 metres from the sea, less than 1 minute away!?? Kuarangi National Park. (Riwaka Resurgence).